Set of processes, business rules, workflows, tools and principles that offer a goal-based crowdsourced innovation framework and methodology. Identify and target specific problem areas or opportunities and collaboratively develop actionable solutions for them. These tools, as standalone applications, are not designed to address the challenges organizations face in their quest to constantly innovate in this hyper competitive world. 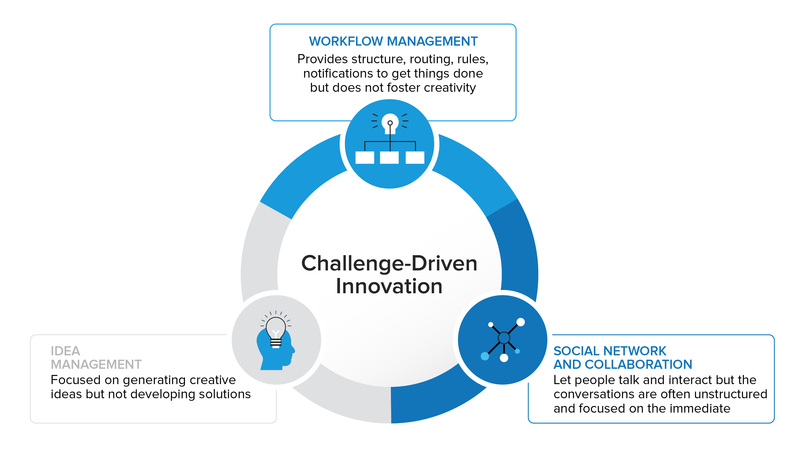 This is where Challenge-Driven Innovation excels by offering a challenge-driven, crowdsourced, workflow-based framework and methodology that leads to finding much sought after solutions addressing the distinct and specific obstacles the organization is confronting.